Need new apps for your favorite device? Here are 31 iPhone, iPad and iPod touch apps that just hit the App Store. 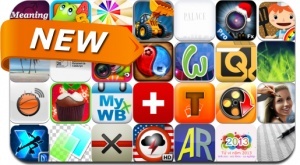 This new apps alert includes X-Runner, Christmas Cupcakes, Linked Together, PhotoJus Christmas FX Pro, Woogey, PhotoLayers, Any Video Downloader, Hoops-Nation and many others. Christmas Cupcakes : Make & Bake FREE!